Don't spend any more valuable time searching for materials you need to build your case. 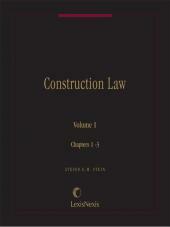 Construction Law Library on CD provides everything you'll need -- quick access to the most comprehensive and authoritative resources on the subject. In addition, you will receive applicable case law. All of this, in one convenient format and one affordable price, makes this CD the one tool you can rely on for your construction cases.